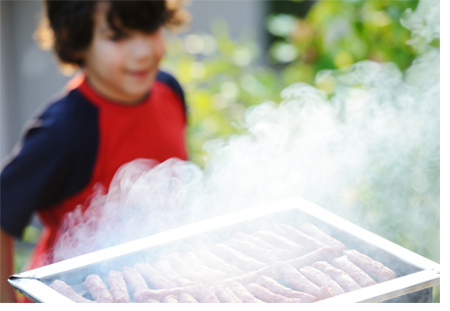 Aussie BBQs provide many hours of fun and enjoyment to Australian families and friends but there are some hazards you need to be aware of. Consideration should be given to minimise the use of BBQ once they have been used to cook a meal, and Alcohol consumption kept to a minimum whist using a BBQ. Check for any fire restriction before having a BBQ, particularly a wood fired BBQ. Give your BBQ and gas bottles a once over checking fittings to make sure they are not damaged and secured. Use the BBQ in a safe area with stable ground, ensure it is well away from dwelling, property structures such as sheds, fencing and gardens shrubs. Always site a barbecue on a firm, level base sheltered from wind gusts and well away from anything flammable like garden sheds, vegetation, fences etc. Don’t allow young children to play around operating or hot BBQ. Ensure you set up and use your BBQ in open space and not indoors. If you detect the smell of gas, turn the gas bottle off and investigate the cause before recommencing. Make sure you have fire extinguisher and blanket close by whilst BBQ. When cooking avoid splashing cooking oil on flames or hot rocks as this will ignite. to make sure you & your home are "Fire Safe"